While most people think of the day after Thanksgiving as Black Friday, for me it is “Cook the Carcass Day.” After enjoying the turkey on Thanksgiving Day, Friday means pulling the extra meat from the bones, placing the carcass in a big pot along with water, celery, onions and cooking for several hours. The result is a wonderful broth with scraps of turkey which is used for soup now with the extra broth frozen to pull out on a cold winter day. If you are going to have soup, then you need a good loaf of bread. 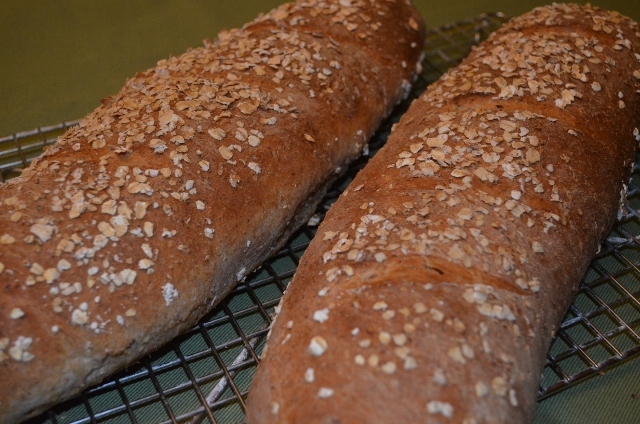 I did not have time to make the no-knead bread which we like so much but found another recipe for a multi-grain bread. This bread uses 10 Grain Hot Cereal or 7 Grain Hot Cereal. 1. Pour the 2 1/2 cups of boiling water over the 7 Grain Hot Cereal. Stir and let set until temperature cools to 100 degrees (about 1 hour). 2. After cooling, pour the hot cereal into the bowl of a stand-mixer. Add honey and yeast. Mix until combined. Add melted and cooled butter and salt. Slowly add flour. Knead until all ingredients combine. 3. Knead dough until smooth and elastic (approximately 8 minutes). Place dough in an oiled bowl (can use non-stick spray). Cover with a towel and set in a warm place for one hour or until doubles in bulk. 4. Remove dough from bowl and place on a lightly floured surface. Divide into two sections and press into a 9 x 12 rectangles. Beginning at long edge roll up each section of dough and pinch ends. 5. Sprinkle oatmeal on a surface. Spray each dough log with non-stick spray and roll in oats to coat. Using a sharp knife make several cuts on the top of each loaf. Place on a cookie sheet. Cover and let rise a second time – approximately one hour. 6. Preheat oven to 350 degrees. If you wish to use a pizza stone, place in oven to heat. 7. Place loaves in oven and bake for 35-40 minutes. Remove from oven and allow to cool on a wire rack. Slice and enjoy! My Larry would love this! thanks Mary.